Still from Vertov's Man with a Movie Camera, 1929. David Abelevich Kaufman (Давид Абелевич Кауфман; Denis Kaufman; pseudonym Dziga Vertov; Дзига Вертов) was a director, screenwriter, and theoretician of documentary film, one of the creators of its language. He came to Soviet documentary film in 1918, inspired by the ideas of the revolution, and became known as a vivid innovator and experimenter. Vertov’s films One Sixth of the World (1926), Enthusiasm: Symphony of the Donbass (1930), Three Songs about Lenin (1934), and especially Man with a Movie Camera (1929) remain models for generations of documentary filmmakers. His filming practices and theories influenced the cinéma vérité style of documentary moviemaking and the Dziga Vertov Group, a radical filmmaking cooperative which was active in the 1960s. Vertov's brothers Boris Kaufman and Mikhail Kaufman were also noted filmmakers, as was his second wife, Elizaveta Svilova. A biography of Vertov presented here borrows from what appears to be the most informed English-language account of Vertov's life to this day, the film and Slavic literature scholar John MacKay's 2012 essay, "Dziga Vertov (1896-1954)". One of his numerous essays on Vertov informed by his archival research in Russia, Ukraine and Poland, it is to be followed by a book-length study. Some visual material and English translations of Vertov's quotes are sourced from Andrey Smirnov's groundbreaking book on early sound experiments and electronic music in Russia, Sound in Z. Additional sources were consulted. Vertov was born David Abelevich (later changed to Denis Arkadievich) Kaufman into a Jewish book-dealer’s family in Białystok, Russian Empire (now Poland). He was a pupil at the Białystok Modern School [realnoe uchilishche] from August 1905 through June 1914, and (from c1912) studied violin, piano and music theory at the city's conservatory as well. Starting in the fall of 1914, Vertov began a general course of study at psychologist Vladimir Bekhterev's famous Psychoneurological Institute in Petrograd — the only Russian institution prior to the February Revolution (of 1917) that was accepting Jewish students. His classmates counted the future globetrotting Soviet journalist Mikhail Koltsov (his former classmate from Białystok as well), future journalist Larissa Reisner, future film historian and filmmaker Grigorii Boltianskii, and future director Abram Room. Meanwhile, with the advance of German troops into Białystok in August 1915, Vertov's family became refugees in Petrograd and later Moscow. Vertov was recruited into a special musical section at a military academy in Chuguev, near Khar’kov, Ukraine – early in the fall of 1916, and never returned to his studies in the Psychoneurological Institute, although he may have intended to. He remained at the academy until the February Revolution of 1917, after which time he left for Moscow, the city that was to be his base for the remainder of his days. He took his pseudonym at around 1918. “Vertov” is a futurist neologism derived from the Russian verb vertit’sia, to spin or turn; “Dziga” is the Ukrainian word for a “(spinning) top”, although he has been signing his poems in that fashion since at least 1915. As an adult, he was formally addressed as "Denis Arkadievich Vertov", and this sort of Russification of name was typical for the young members of the Russophilic Jewish milieu in which he grew up. Impressed and influenced, like many others of his generation, by futurism, he began to write science fiction and sound poems, experimenting with the perception and arrangement of sound. During the summer 1916 vacation he began his first experiments with sound, producing verbal montage structures. In 1916 he attempted what would now be called sound poetry and audio art. As he put it: "I had an idea about the need to enlarge our ability for organized hearing. Not limiting this ability to the boundaries of usual music. I decided to include the entire audible world into the concept of 'Hearing'." He attempted to create new forms of organization of sound by means of a rhythmic grouping of phonetic units. During his schooling Vertov struggled with text. Once, preparing for classes, he discovered that after organizing geographical place names in a rhythmic order, he could easily remember the entire sequence. This became his favourite method of memorizing. "As a result of these self-enforced experiments I became interested in the rhythmic organization of separate elements of the visible and audible world in general. The next stage was my passion for editing shorthand records. It concerned not only the formal connection of these pieces but also the interaction of meanings of separate pieces of shorthand records. It also concerned my experiments with gramophone recordings, where from the separate fragments of recordings on gramophone discs a new composition was created. But I was not satisfied experimenting with available pre-recorded sounds. In nature I heard considerably more different sounds, not just singing or a violin from the usual repertoire of gramophone discs." "On vacation, near Lake Ilmen. There was a lumber-mill which belonged to a landowner called Slavjaninov. At this lumber-mill I arranged a rendezvous with my girlfriend... I had to wait hours for her. These hours were devoted to listening to the lumber-mill. I tried to describe the audio impression of the lumber-mill in the way a blind person would perceive it. In the beginning I wrote down words, but then I attempted to write down all of these noises with letters. Firstly, the weakness of this system was that the existing alphabet was not sufficient to be able to write down all of the sounds that you hear in a lumber-mill. Secondly, except for sounding vowels and consonants, different melodies, motifs, could still be heard. They needed to be written down as musical signs. But corresponding musical signs did not exist. I came to the conviction that by existing means I could only achieve onomatopoeia, but I couldn’t really analyze the heard factory or a waterfall... The inconvenience was in the absence of a device by means of which I could record and analyze these sounds. Therefore I temporarily left aside these attempts and switched back to work on the organization of words. Working on the organization of words, I managed to destroy that contrast which in our understanding and perception exists between prose and poetry... Some of these works, which seemed to me more or less accessible to a wide audience, I tried to read aloud. More complex works, which required a long and careful reading, I wrote down on big yellow posters. I hung out these posters in the city. I attached them myself. My work and the room where I worked were called the ‘Laboratory of Hearing’." Radio-Ear. 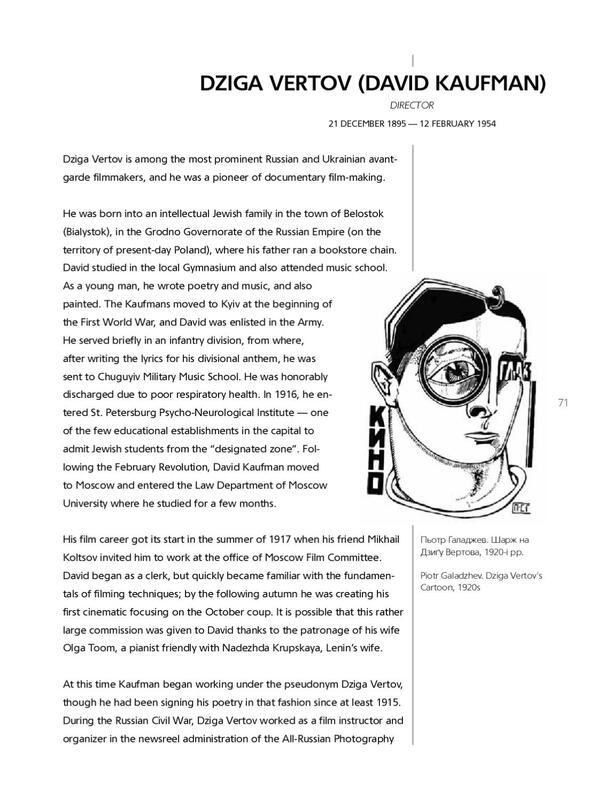 Dziga Vertov. Portrait by P. Galadjev, 1926. After the 1917 February Revolution Vertov was for several months studying law at Moscow University, also attending lectures in the Department of Mathematics. Koltsov, who became acquainted with the Bolshevik intellectuals Anatoly Lunacharsky and Grigorii Chicherin shortly after the October 1917 events, and was named chair of the newsreel division of the All-Russian Cinema Committee of the People’s Commissariat of Enlightenment early in 1918, hired Vertov as his secretary in May of that year. Although Vertov, unlike Koltsov, never joined the Bolshevik Party – indicating instead in a 1918 questionnaire that his political sympathies were “anarchist-individualist” in character – he became committed early on to the Soviet cause, as both an administrator and a filmmaker. Vertov, being frustrated by the absence of any adequate means for sound recording, switched to film. As he reflected: "Once in the spring of 1918... returning from a train station there lingered in my ears the signs and rumble of the departing train ... someone swearing ... a kiss ... someone’s exclamation ... laughter, a whistle, voices, the ringing of the station’s bell, the puffing of the locomotive ... whispers, cries, farewells ... And I thought to myself whilst walking: I must get a piece of equipment that won’t describe but will record, photograph these sounds. Otherwise it’s impossible to organize, to edit them. They rush past, like time. The movie camera perhaps? Record the visible ... Organize not the audible, but the visible world. Perhaps that’s the way out?" By the end of 1918, Vertov had taken over administrative responsibility for the first Soviet newsreel series, Kino-Nedelya [Кино-Неделя; Cinema Week] (43 issues between May 1918 and June 1919); in 1920 and 1921, he took part as administrator, programmer and film presenter on the "October Revolution" agitational train, one of a number of such trains that went through territories recently captured by the Red Army during the civil war, propagandizing for the new regime, and often carrying various high-level representatives of that regime onboard. (It was in connection with his work on this train that he met his first wife, pianist and fellow activist Olga Toom.) During this period, he made the acquaintance of many figures who would play important roles in Soviet fiction and non-fiction film, including actor and director Vladimir Gardin, director and pedagogue Lev Kuleshov, and cameramen Eduard Tisse and Aleksandr Levitskii. By 1922 he was one of those in charge of newsreel production at Moscow’s film studio, and remained at the center of non-fiction film work there until 1927. Vertov worked on the Kino-Nedelya series for three years, helping establish and run a film-car on Mikhail Kalinin's agit-train during the ongoing Russian Civil War between Communists and counterrevolutionaries. Some of the cars on the agit-trains were equipped with actors for live performances or printing presses; Vertov's had equipment to shoot, develop, edit, and project film. The trains went to battlefronts on agitation-propaganda missions intended primarily to bolster the morale of the troops; they were also intended to stir up revolutionary fervor of the masses. In 1919, Vertov compiled newsreel footage for his full-length documentary Anniversary of the Revolution; in 1921 he compiled History of the Civil War. He followed it with two short films, Battle of Tsaritsyn (1920, now lost), about a Civil War battle, the first film on which Vertov worked with the woman who would be his second wife and main lifelong collaborator, veteran film editor Elizaveta Svilova, and The Agit-Train VTSIK (1921) from touring together with President Kalinin the battlefronts of southwest Russia on a propaganda train known as The October Revolution. In 1922, he made the thirteen-reel History of Civil War (1922). From the kinoks' manifesto, LEF, 1923. 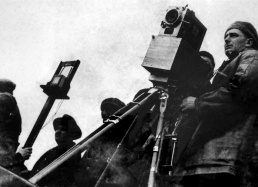 Although the initial idea for a major Soviet newsreel combining information and agitation came from director Fyodor Otsep of the non-state-owned “Rus’” firm, the Commissariat of Enlightenment (Narkompros) decided to entrust the task to Vertov’s documentary group, who were soon to become known as the kinoks (from the Russian kino [cinema] and oko [eye]). At the centre of that group were Svilova and cameramen Ivan Belyakov and Mikhail Kaufman; the latter had been demobilised in 1922, after having served as a driver and mechanic in the Red Army during the civil war, and was to be Vertov's close collaborator for the next seven years. 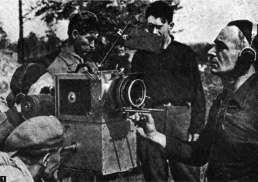 The use of the candid camera was adopted by the kinoks (the Council of Three and followers) in 1923 or 1924, possibly in large part as a result of Mikhail Kaufman's filming experience, since Vertov was primarily an editor, not a cameraman. In 1926 Mikhail Kaufman made the documentary film Moscow, whose structure, relating a day in the life of a great industrial city, seems to have influenced both Walter Ruttmann's Berlin: Symphony of a Great City (1927) and Vertov's Man with a Movie Camera (1929). 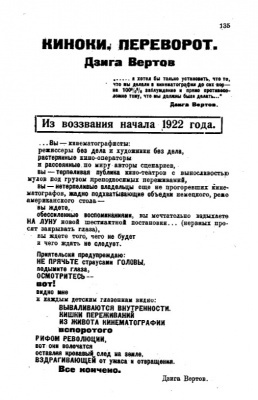 In December 1922, the group ("Council of Three") issued an appeal to Soviet filmmakers, published under the title "Kinoks: A Revolution (Appeal for a Beginning)" in the June 1923 issue of the magazine LEF, in which they derided all fiction films as backward, packed with lies and powerless while lauding those films that recorded the truth of real life ‘caught unawares’. 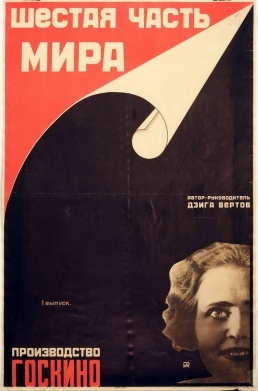 The culmination of the Kino-Pravda period is the feature-length film Kino-Eye: Life Caught Unawares [Kinoglaz: Zhizn’ vrasplokh] (1924), which comprises five autonomously structured reels joined only by the overriding theme of the activities of the Young Pioneer troops from Moscow’s “Red Defense” factory and from the village of Pavlovskoe, located near the capital. 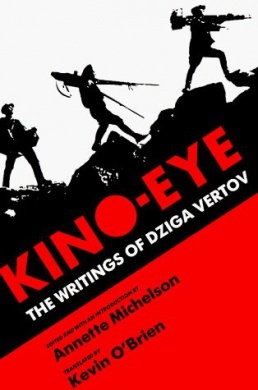 1924 and Kino-Eye also saw the culmination of Vertov’s efforts to establish kinok groups throughout the USSR, mainly via the networks established by the still somewhat inchoate Pioneer organization. Alexander Rodchenko, One Sixth of the World, poster, 1927. Vertov’s success with the Lenin memorial film Kino-Pravda 21 led to two major commissions: Stride, Soviet! (Shagai, Sovet!, 1926), an election-year promotional film for the Moscow City Soviet, and the grandiose One Sixth of the World (Shestaia Chast’ Mira, 1926), a film commissioned by the state trade organization Gostorg to promote Soviet exports abroad. Both films became occasions for remarkable experiments in structure, audience address, and intertitle construction, and aroused considerable interest, controversy and, from some of those who commissioned the films, ire. In particular, One Sixth of the World’s combination of savage anti-capitalist satire, ethnographic cataloguing, and ambiguous economic argumentation, all articulated across an arc of Walt Whitman-inflected poetic intertitles, proved difficult to assimilate, and the film was never, in fact, used for promotional purposes. Vertov was fired at the beginning of January 1927 from Moscow’s Sovkino studio, following the release of the film, after a series of ferocious arguments with studio head Ilya Trainin. The disputes initially centered on what was thought to be the excessive cost of the One Sixth production and on Trainin’s decision to pass directorial control over a planned found-footage film commemorating the tenth anniversary of the Revolution to Esfir Shub, reached the boiling point when Vertov, advocate of the non-scripted film, refused to present Trainin with a script for Man with a Movie Camera, footage for the never-realised first version of which Vertov had been amassing through 1925-26. After several months of melancholy unemployment (during which time he wrote a script for a never-to-be-produced film on Jewish agricultural settlement in the Crimea), Vertov was hired by VUFKU (the All-Ukrainian Photo-Film Directorate, based in Kyiv and at this time staffed with artists and administrators sympathetic to Ukrainian futurism), under whose auspices he made three masterpieces in quick succession. Biosphere, Man with a Movie Camera, 2001. In 1996 Norwegian composer Geir Jenssen ("aka Biosphere") was commissioned by the Tromsø International Film Festival to write a new soundtrack for the movie, using the director's written instructions for the original accompanying piano player. Jenssen wrote half of the soundtrack, turning the other half to Per Martinsen (aka Mental Overdrive). It was used for the Norwegian version, "Mannen med filmkameraet", at the 1996 TIFF. The scored movie was not available after the festival. Soundtrack released in 2001 on CD. This edit of the film contains only the parts written by Biosphere. Vertov was first contracted by VUFKU to make a film about industrialization in the Ukrainian SSR, with a focus on the construction of the Dnepr Hydroelectric Station. This film was released in 1928 as The Eleventh Year [Odinnadtsatyi]. Soon afterwards, he resumed work on his pet project, Man with a Movie Camera [Chelovek s kinoapparatom] (1929). This work, shown in Germany, France, England and the United States after its initial release, fell into almost total obscurity for the next thirty years. Now widely regarded as the most formally inventive and intellectually complex film of the silent era, Man with a Movie Camera has become a touchstone for discussions of documentary, experimental practice in film, and cinematic self-reflexivity. The film was also, however, his last collaboration with Mikhail Kaufman: relations between the brothers had become strained during the production of The Eleventh Year, and they were on non-speaking terms until 1933. This section is to be expanded. Stenberg brothers, The Eleventh Year, poster, 1928. Original Man with a Movie Camera poster, 1929. Stenberg brothers, Man with a Movie Camera, poster, 1929. Vertov during the shooting of Enthusiasm. Vertov’s final Ukrainian--and first sound--film, Enthusiasm: Symphony of the Donbass [Entuziazm: Simfoniia Donbassa] (1930), shot in the heat of the First Five-Year Plan in the mines and factories of Eastern Ukraine, is both one of his most politically problematic works – the film was shot during the beginning stages of agricultural collectivization, though not during the most violent and destructive phases of that campaign – and one of his most artistically innovative, especially as regards its unprecedented and still astonishing use of documentary sound. The film at once depicts, celebrates, participates in and was shaped by the First Five-Year Plan for economic development (1928-1932), the Stalin regime’s ambitious industrialization campaign. The Donbass area of eastern Ukraine, rich in coal and iron deposits, in which Vertov, Svilova and their team of kinoks filmed and recorded most of Enthusiasm, was one of the main “fronts” of the Plan. The trope of the Donbass as absolute center seems to derive from a passage in a speech Lenin gave at the 11th Congress of the Russian CP in March 1922, a passage quoted verbatim on Vertov’s “idea chart”: “[The Donbass] is the center, the real basis of our entire economy. There can be no question of any renewal of heavy industry in Russia, no question of any real construction of socialism (for there is no way to build it except through heavy industry), if we do not revive the Donbass and bring it back up to the mark” Securing the Donbass had been one of Lenin’s major strategic concerns during the Civil War. The kinoks shot without sound in the Donbass from September to November 1929, continued in Leningrad during four days in January 1930 at St. Isaac’s Cathedral, at a sound movie theater and other locales around the city, while at the same time engaging in an intensive study of sound technology. After a crash course in the inventor Alexander Shorin’s system of sound recording (involving experiments conducted both at the professor’s laboratory and open-air), the group shot documentary sounds and images in and around Leningrad until May 1930. They were in Kharkov for the Eleventh Ukrainian Party Congress (5-15 June 1930), and soon after that went to the Donbass, where they remained until around the end of July. The film begins with an overture on the “clearing of social space” (through the abolition of the twin “opiates” of religion and alcohol) as precondition for socialist construction (reels 1 and 2); moving to the long middle section on the industrialization of the Donbass region of Ukraine (reels 3 through 5); and a last movement (reel 6) where the products of industrialization flow back to the USSR (most notably to the countryside) and are celebrated. The beginnings of the Enthusiasm score, with a ticking clock in “D” section, "Pioneer" drum in “E” section. 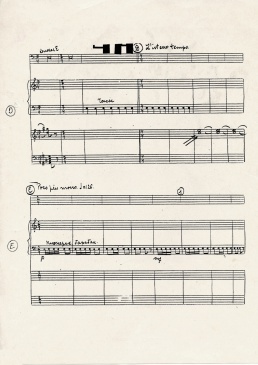 End of the “J” section of the score, with the ticking of a clock in an indeterminate meter joined with the sound of a motor (the latter indicated by a wavy line). Ukrainian poster for Enthusiasm, 1931. The portable sound-on-film equipment specially built by Alexander Shorin allowed kinoks to record actual urban sounds: industrial noises in the har­bour, sounds of the railroad and the railway station, streets and trams, utilized in the film. Vertov considered this film a Symphony of Noises and it is structured as a programmatic four-movement symphony in which leitmotivs and refrains develop a musical narration. Vertov was uninterested in using imitative instruments to recreate sounds and was irritated by such imitations in early sound films; instead the kinoks developed the techniques based on montage and relying on varying the speed of recorded sounds in post-production. They could edit the soundtrack by cutting sounds, putting them in loops and combining them according to principles of musical composition. 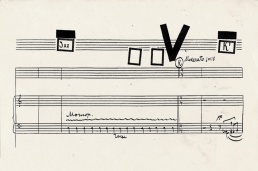 For this, in late November 1929 together with the composer Nikolai Timofeev Vertov developed a musical score that integrated noises and their transformation, distortion and variation, forerunning the aesthetics of musique concrète by nearly two decades. Nevertheless, following political problems, he never returned to it. The film contains a unique documentary about the training of Aleksei Gastev’s CIT cadets, biomechanical ballet, recalling performances in Solomon Nikritin’s Projectionist Theatre. After its first public screenings in Europe in 1931 the film achieved significant success. In a note sent to Vertov from London, Charlie Chaplin wrote: "Never had I known that these mechanical sounds could be arranged to sound so beautiful. I regard it as one of the most exhilarating symphonies I have heard. Mr. Dziga Vertov is a musician. Professors should study with him and not argue." In Germany, after initially generating intense interest, the film was banned by the government in October 1931 (while Vertov was touring Europe), a prohibition that elicited protest from Joris Ivens, Hans Richter, Béla Balázs, and Lászlo Moholy-Nagy, among others. "Now, concerning the noises themselves: I declare categorically that there’s not one noise in the film. This notion of “noise” is deployed simply in order to scare workers in sound film away from the sounds that exist in nature. These existent [...] sounds are called “noises” only in order to distinguish them from so called music; that is, from those various “do, re, mi, fa”’s and the like, which we can handle very well and can distinguish wonderfully from one another—while at the same time [being] unable to distinguish one natural sound from another (for example the sound of a steam engine, the sound of a threshing-machine, a steamship piston, and so on) in all of its nuances. Yes, for a domestic lapdog, obviously, all sounds are the same—but we’re not domestic lapdogs, we’re not delicate, Western, flowery directors; we do not make, as Eisenstein does, gypsy romances; and for us, there are no noises. We must acknowledge that we began [in cinema] like literary people, that we’re not sufficiently literate in existing sounds and don’t distinguish among them. If [...] you go to the Donbass, then all you’ll hear [at first] is one uninterrupted roar and noise—that’s the first impression. But this wasn’t my first time in the Donbass; I studied these sounds and saw that, yes, we really are domestic, and for us these sounds are “noise”—but for the worker in the Donbass every sound has a specific meaning; for him there are no “noises.” And if it seems to you, comrades, who know all the scales perfectly, that I am at this moment emitting pure noise, then I can assure you that I am [producing] no noise whatsoever." By June 1932 Vertov was working at the Mezhrabpomfil’m studio, and spent most of the next year and a half working on what was to be his greatest popular success, Three Songs about Lenin [Tri pesni o Lenine] (1934). A tribute to Lenin that integrates many of the tropes and even some of the footage from Vertov’s 1920s films with “folk” music and poetry and innovative sync sound interviews, Three Songs about Lenin turned out to be the last film over which Vertov had relatively complete artistic control. The highly selective deployment of "folk" motifs from the Muslim regions of the USSR, together with his innovative sync sound interviews with workers, produced at once Vertov's most powerful representations of the coordination of national-ethnic and Soviet identities, and his most successful attempt to accommodate his experimental formal preoccupations with the new stress on narrative clarity and exemplary subjects typical of emergent socialist realism. He was awarded the Order of the Red Star in 1935, and had the opportunity to re-release the film in 1938, after adding a section of a speech by Stalin to the conclusion, and removing images of political luminaries who had in the interim become “enemies of the people” (Trotsky, Zinoviev, Kamenev or Radek). Unlike Mikhail Koltsov, Vertov and Svilova escaped the Terror of 1937-38 physically unscathed; they even received a modest new apartment at the end of 1938, but no other “perks” were coming their way, as it turned out. It seems that Vertov's loss of the patronage of Koltsov (and no doubt others) during the Terror, his inability to sustain a working collective, his often vocal obstinacy, and his gradually declining health all contributed to the waning of his productivity from 1938 onward. For Lullaby [Kolybel’naia] (1937), he wrote a script attacking the historical exploitation (particularly the sexual exploitation) of women, but his conception was altered almost beyond recognition during the course of production. In the end, Lullaby, which also enjoyed a U.S. release but played only a few days on Soviet screens, ended up being less about women than about children and the “paternal care” offered to all Soviet citizens by the state, as personified by Stalin and given codified form in the 1936 constitution. In the late 1930s and early 1940s, in the wake of Lullaby, Vertov and Svilova ended up wandering from one studio to another, working on films that either went unreleased (Three Heroines [Tri geroini], 1938, about the famous women pilots Raskova, Osipenko, and Grizodubova), or unproduced altogether (The Girl and the Giant [Devochka i velikan], on which he conceived in 1940-41 with famous children’s author M. Il’in). Vertov's health had begun to fail from the mid-1930s, and while in Alma-Ata during World War II (where he made a remarkable film about Kazakh war production entitled To You, Front [Tebe, Front], 1942), he suffered a nervous breakdown. During the war, the Nazis murdered Vertov’s father, mother and all his close relatives from Bialystok and the surrounding area sometime between 1941 and 1943. Along with Mikhail and Boris, Vertov attempted to uncover the details about his family’s fate, but to no avail. Svilova was responsible for editing the very first film about Auschwitz [Osventsim] (1945), and worked with Roman Karmen on a major documentary about the Nuremberg Trials (Judgement of the Peoples [Sud narodov], 1946), which won a Stalin Prize; she herself had received this prize for her work with Yuli Raizman on Berlin (1945), which also garnered the best short film award at the 1946 Cannes Film Festival. Vertov’s last noteworthy film, The Oath of Youth [Kliatva Molodykh], about the commitment of Komsomol members to the war effort, was roundly criticised by studio supervisors in August 1944 and not accepted for wide release. In the months that followed, until the end of 1944, Vertov desperately proposed at least five different script ideas in rapid succession, but like virtually all the proposals he had offered since 1938, they went unproduced and unnoticed. After this point – that is, from 1944 until 1954, when he died - Vertov stopped presenting ideas for films, or new ideas about film, instead managing to find occasional work on non-descript News of the Day newsreels. 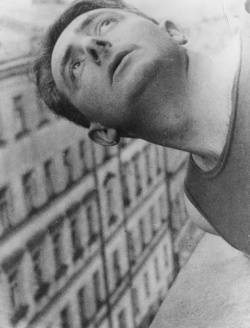 Dziga Vertov died of stomach cancer in Moscow in 1954. 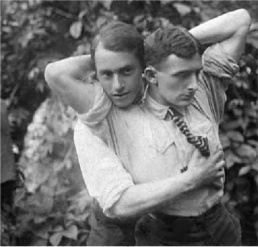 With brother Mikhail Kaufman, 1910s. Several years later, Vertov married his long-time collaborator Elizaveta Svilova. Vertov's brother Mikhail Kaufman (1897-1980) was Vertov’s main cameraman and close collaborator between 1922 and 1929, and later became an important documentary director in his own right. His other brother, Boris (1903-1980), never practiced filmmaking in Russia, and began to work as a cameraman and sometime co-director in France in the mid-1920s, eventually doing the cinematography for the early films of Jean Lods, all the films of Jean Vigo, and, still later in the US, for films like Sidney Lumet’s Twelve Angry Men (1957) and Elia Kazan’s On the Waterfront (1954), for which he won an Academy Award. Svilova, who retired immediately after Vertov’s death, dedicated the rest of her life to promoting his memory. Kopalin, too -- by now teaching in the documentary section of the state film school and one of the grand old men of Soviet nonfiction film -- began writing and publishing about Vertov’s films as early as June 1955. Articles about and references to Vertov and his films started to appear with some regularity in the pages of official Soviet film publications from 1956 onwards, and serious scholarship on Vertov (carried out by Nikolai Abramov, Sergei Drobashenko, Viktor Listov, Lev Roshal’, and others) was well underway in the USSR by the mid-1960s. Abroad, full retrospectives were staged as early as 1960 in Leipzig, followed by important screenings in Paris, Venice, and Vienna. The Western memory of Vertov was sustained by some of those who had known his work (Joris Ivens, Hans Richter, Leon Moussinac) and some who had not, like Georges Sadoul, whose posthumous book on Vertov (1971) appeared around the same time as Jean-Luc Godard and Jean-Pierre Gorin’s experimental Groupe Dziga Vertov collective, and preceded the major essays and books by Annette Michelson, Seth Feldman, Vlada Petrić, and (later) Yuri Tsivian, Thomas Tode, Aleksandr Deriabin, Emma Widdis, Oleg Aronson, Elizabeth Papazian and John MacKay among others. Although the late 1980s and 1990s saw the beginnings of a reconsideration of Vertov in light of his propaganda work on behalf of Soviet power, his reputation has been complicated rather than undermined by new research, including recent assimilations of Vertov to media studies (Lev Manovich, the Vienna-based "Digital Formalism" project). The Russian State Archive of Literature and Art has Vertov's writings and pictures donated by Svilova. Vertov's collection at Svenska Filminstitutet, pursued by Anna-Lena Wibom, contains mainly photocopies of texts, but also frame enlargements and photos. The Dziga Vertov Collection at the Austrian Film Museum includes film scripts, records, writings, photographs and collected news coverage originally collected by Svilova. Background. Kino-nedelya [Кинонеделя; Cinema Week], 43 installments, 1919.   . Weekly newsreels. Produced by the Film Committee of the People's Commissariat of Public Education (Moscow). 1 June 1918 through 24 December 1919. Written and directed by Vertov. Godovshchina revolyutsii [Годовщина революции; The Anniversary of the Revolution], 12 reels, 1919. . Historical chronicle. Produced by the Film Committee of the People's Commissariat of Public Education (Moscow). Directed by Vertov. Boy pod Tsaritsynym [Битва в Царицыне; The Battle of Tsaritsyn], 3 reels, 1919. Produced by the Revolutionary Military Council and the Film Committee of the People's Commissariat of Public Education (Moscow). Written and directed by Vertov. 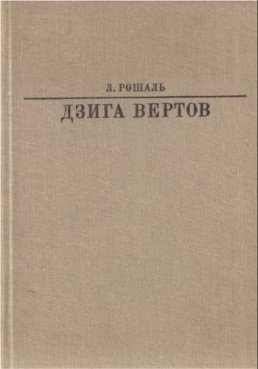 Protsess Mironova [Процесс Миронова; The Trial of Mironov; The Mironov Case], 1 reel, 1919. Produced by the Revolutionary Military Council and the Film Committee of the People's Commissariat of Public Education (Moscow). Written and directed by Vertov. Vskrytie moshchey Sergiya Radonezhskogo [The Disinterment of Serge Radoneski], 2 reels, 1921. Film-reportage. Produced by the Film Committee of the People's Commissariat of Public Education (Moscow). Written and directed by Vertov. Agitpoezd VTsIK [Агитпоезд ВТсИК; The Propaganda Train of the Russian Central Executive Committee], 1 reel, 1921. Travelogue. Produced by the Russian Central Executive Committee and the Film Committee of the People's Commissariat of Public Education (Moscow). Written and directed by Vertov. Istoriya grazhdanskoy voyny [История гражданской войны; A History of the Civil War], 13 reels, 1922. Historical chronicle. Produced by the Photo-Film Division (Moscow). Written and directed by Vertov. Protsess eserov [Процесс эсеров; The Trial of the Socialist Revolutionaries; Trial of the Socialist-Revolutionary Party], 3 reels, 1922. Produced by the Photo-Film Division (Moscow). Written and directed by Vertov. Kinokalendar (State Film-Calendar), 55 issues, 1923-25. Daily and weekly (flash) newsreels. Produced by Goskino (Kultkino). 21 July 1923 through 5 May 1925. Written and directed by Vertov. Includes "Lenin Film-Calendar". Kino-Pravda [Кино-Правда], 23 issues (30-37, 40, 43), 1922-25.         . Film-newspaper. Produced by Goskino (Moscow). 5 June 1922 through 1925. Shooting plan, intertitles, and direction by Vertov. 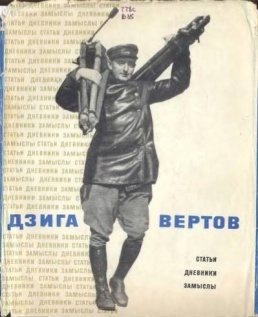 All installments of the Kino-pravda appeared under this title, with the exception of the eight issues: Yesterday, Today, Tomorrow (13), 1923; Autumn Pravda (16), 1923; Black Sea--Sea of Ice--Moscow (19), 1924; Pioneers' Pravda (20), 1925; Leninist Kinopravda (21), 1924; Lenin Lives in the Peasant's Heart (22), 1925; Radio-Kinopravda (23), 1925; Give Us Air (Special issue), 1924. Sovietskie igrushki [Советские игрушки; Soviet Toys], 1924. Kino-Glaz: zhizn' vrasplokh [Кино-глаз: Жизнь врасплох; Kino-Eye: Life Caught Unawares / Kino-Eye: Life Unrehearsed], first series, 6 reels, 1924.  . Produced by Goskino (Moscow). Written and directed by Vertov. Cameraman: Mikhail Kaufman. Shagay, sovet! [Шагай, Совет! ; Stride Soviet (The Moscow Soviet: Past, Present, and Future], 6 reels, 1926. Newsreels. Produced by Goskino (Kultkino) (Moscow). Written and directed by Vertov. Cameraman: I. Belyakov. Film scout: Kopalin. Assistant to the director: Elizaveta Svilova. Shestaya chast mira [Шестая часть мира; A Sixth of the World (Gostorg's Import-Export. 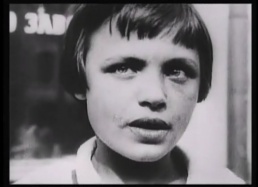 Kino-Eye's Travels through the USSR], 6 reels, 1926.    . Film-poem. Produced by Goskino (Kultkino) and Sovkino (Moscow). Written and directed by Vertov. Assistant director and chief cameraman: Mikhail Kaufman. Cameramen: I. Belyakov, S. Benderski, P. Sotov, N. Constantinov, A. Lemberg, N. Strukov, I. Tolchan. Film scouts: A. Kagarlitski, I. Kopalin, B. Kudinov. Odinnadtsatyi [Одиннадцатый; The Eleventh Year / The Eleventh], 6 reels, 1928.  . Newsreels. Produced by the Ukrainian Film and Photography Administration (VUFKU) (Kiev). Written and directed by Vertov. Cameraman: Mikhail Kaufman. Assistant to the director: Elizaveta Svilova. Chelovek s kino-apparatom [Человек с киноаппаратом; Man with a Movie Camera], 6 reels, 1929.    . Film-feuilleton. Produced by the Ukrainian Film and Photography Administration (VUFKU) (Kiev). Written and directed by Vertov. Chief cameraman: Mikhail Kaufman. Assistant to the director: Elizaveta Svilova. With the Biosphere soundtrack, 2001. Entuziazm: Simfoniya Donbassa [Энтузиазм: Симфония Донбаса; Enthusiasm: Symphony of the Donbass], 6 reels, 1930.    . Documentary sound film. Produced by Ukrainfilm. Written and directed by Vertov. Cameraman: B. Zeitlin. Sound engineer: P. Shtro. Assistant to the director: Elizaveta Svilova. Tri pesni o Lenine [Три песни о Ленине; Three Songs About Lenin], 6 reels, 1934.    . Documentary sound film. Produced by Mezhrabpomfilm. Written and directed by Vertov. Cameramen: D. Sourenski, M. Magidson, B. Monastyrsky. Sound engineer: P. Shtro. Score by I. Shaporin. Assistant to the director: Elizaveta Svilova. Kolybelnaya [Колыбельная; Lullaby], 7 reels, 1937.  . Documentary sound film. Produced by Soiuzkinokhronika. Written and directed by Vertov. Co-director: Elizaveta Svilova. Soiuzkinokhronika cameramen. Score by D. and D. Pokrass. Sound engineer: I. Renkov. Lyrics by V. Lebedev-Kumach. Pamyati Sergo Ordzhonikidze [Памяти Серго Орджоникидзе; In Memory of Sergo Ordzhonikidze], 2 reels, 1937. . Special issue. Produced by Soiuzkinokhronika. Editor: Vertov. Co-director: Elizaveta Svilova. Sergo Ordzhonikidze [Серго Орджоникидзе; Sergo Ordzhonikidze], 5 reels, 1937. Documentary sound film. Produced by Soiuzkinokhronika. Directed by Vertov, I. Bliokh, E. Svilova, V. Dobronitsky, Soloviev, Abjibeliachvili. Score by I. Dunayevsky. Sound engineers: I. Renkov, S. Semenov. Musical arrangements by D. Blok. Lyrics by Lebedev-Kumach. Hail the Soviet Heroines!, 1 reel, 1938. Special issue. Produced by Soiuzkinokhronika. Written and directed by Vertov. Co-director: Elizaveta Svilova. Soiuzkinokhronika cameramen. Tri geroini [Три героини; Three Heroines], 7 reels, 1938. Documentary sound film. Produced by Soiuzkinokhronika. 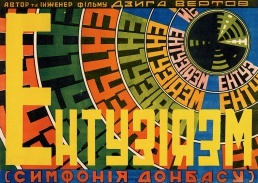 Script by Vertov and Elizaveta Svilova. Directed by Vertov. Chief-cameraman: S. Semenov, with staff of Moscow, Khabarovsk and Novosibirsk newsreel studios. Train views: M. Troyanovsky. Score by D. and D. Pokrass. Sound engineers: A. Kampovski, Fomine, Korotkevitch. Lyrics by Lebedev-Kumach. Assistant to the director: S. Semov. V rayone vysoty A [In the High Zone], 1941. Film-reportage shot on the front of the Great Patriotic War (Film-Newspaper no. 87). Produced by the Central Newsreel Studio. Directed by Vertov. Cameramen: T. Bunimovitch, P. Kassatkin. Krov za krov, smert za smert [Кровь за кровь, смерть за смерть; Blood for Blood, Death for Death (The Misdeeds of the Fascist Invaders in the USSR)], 1 reel, 1941. Produced by the Central Newsreel Sutdio. Filmed by cameramen serving at the front. Directed by Vertov. На линии огня - операторы кинохроники [Newsreel Cameraman in the Line of Fire], 1941. Film-reportages shot on the fronts of the Great Patriotic War. (Film-Newspaper no. 77). Written and directed by Vertov. Co-director: Elizaveta Svilova. Aerial sequences by N. Vikhirev. Kazakhstan - frontu! [Казахстан — фронту! ; To You, Front! (Kazakhstan for the Front)], 5 reels, 1942. . Documentary sound film. Produced by the Alma-Ata Film Studio. Written and directed by Vertov. Co-director: Elizaveta Svilova. Chief cameraman: B. Pumpiansky. Score by G. Popov, V. Velikanov. Sound engineer: K. Bakk. Lyrics by V. Lougovskoy. V gorakh Ala-Tau [В горах Ала-Тау; In the Mountains of Ala-Tau], 2 reels, 1944. Documentary sound film. Produced by the Alma-Ata Film Studio. Written and directed by Vertov. Cameraman: B. Pumpiansky. Co-director: Elizaveta Svilova. Klyatva molodykh [Клятва молодых; The Oath of Youth], 3 reels, 1944. Produced by the Central Documentary Film Studio. Directed by Vertov, Elizaveta Svilova. Cameramen: I. Belyakov, G. Amirov, B. Borkovsky, B. Dementiev, S. Semenov, V. Kossitsyn, E. Stankevitch. Novosti dnya [Новости дня; Daily News], 1944-54. Film-newspaper. Produced by the Central Documentary Film Studio. Vertov's involvement was occasional. 1944: no. 18; 1945: nos. 4, 8, 12, 15, 20; 1946: nos. 2, 8, 18, 24, 34, 52, 67, 71; 1947: nos. 6, 13, 21, 30, 37, 48, 51, 65, 71; 1948: nos. 8, 19, 23, 29, 34, 39, 44, 50; 1949: nos. 19, 27, 43, 45, 51, 55; 1950: nos. 7, 58; 1951: nos. 15, 33, 43, 54; 1952: nos. 9, 15, 31, 43, 54; 1953: nos. 18, 27, 35, 55; 1954: nos. 31, 46, 60.
on UbuWeb: Enthusiasm! (1930), Laboratory Of Hearing (1916), Radio-Ear / Radio-Pravda (1916). Second page of Vertov's "My. 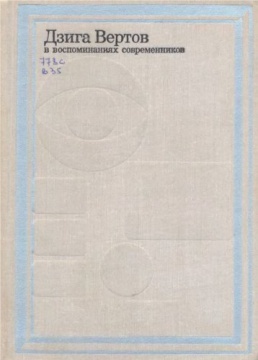 Variant manifesta" (1922) with a diagram illustrating his concept of the interval. Dziga Vertov, Statii, dnevniki, zamysly, 1966. (Russian) Download. 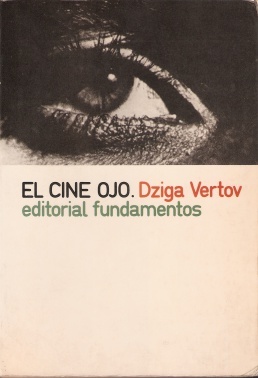 Dziga Vertov, El cine-ojo, 1973. (Spanish) Download. Kino-Eye: The Writings of Dziga Vertov, 1984. Download. Elizabeta Vertova-Svilova, Anna L. Vinogradova (eds. ), Dziga Vertov v vospominanijach sovremennikov, 1976. (Russian) DJVU. Lev Roshal, Dziga Vertov, 1982. (Russian) HTML. 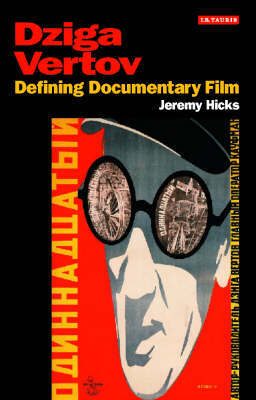 Jeremy Hicks, Dziga Vertov: Defining Documentary Film, 2007. PDF. David Tomas, Vertov, Snow, Farocki: Machine Vision and the Posthuman, Bloomsbury Academic, 2013, 304 pp. John MacKay, "Kinoglaz (Vertov, 1924)", in Il cinema russo attraverso i film, eds. Alessia Cervini and Alessio Scarlato, Rome: Carocci, 2013. (Italian). Translated from English. Dziga Vertov, dir. Peter Konlechner (director of the Austrian Film Museum), 60 min, 1974. Includes footage of Svilova commenting on the excerpts from Vertov's films and their cooperation. 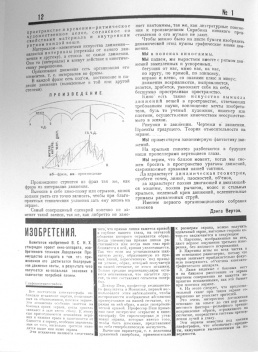 ↑ Speech, 5 April 1935, in Vertov, Iz Nasledia 2, 2008, p 291. Trans. Andrey Smirnov. ↑ Vertov, Draft copy of the article "Kak eto nachalos?" [How has it begun? ], in Iz Nasledia 2, 2008, p 557. Trans. Andrey Smirnov. ↑ V.I. Lenin, Polnoe Sobranie Sochinenii, Vol. 45, Moscow: Politicheskaia literatura, 1964, p 105. ↑ MacKay 2005, pp. 23 Kino-Eye, 1984, p 185. The Russian is from Vertov, Stat'i, dnevniki, zamysly, 1966, p 187. ↑ Vertov 1966, pp. 280-285 English: Michelson 1984, pp. 289-296 Vertov's written plan for Symphony of the Donbass (Enthusiasm). ↑ MacKay 2005, p. 47 Source: RGALI f. 2091, op. 1, d. 37, ll. 10-11. ↑ MacKay 2005, p. 46 Source: RGALI f. 2091, op. 1, d. 37, l. 22. ↑ Film Courier (23.11.1931), Berlin. Quoted by Vertov in "Charli Chaplin, Gamburgskie rabochie i prikazi doktora Virta" [Charlie Chaplin, the Workers from Hamburg and the Prescriptions of Doctor Wirt], Proletarskoe kino 3 (1932). ↑ See John Willett, Art and Politics in the Weimar Period: The New Sobriety, 1917-1933, New York: Pantheon Books, 1978, p 257; and RGALI f. 2091, op. 1, d. 43. ↑ He already filmed The Eleventh Year (1928) there. ↑ MacKay 2005, pp. 41-42 Source: RGALI f. 2091, op. 2, d. 417, l. 59. 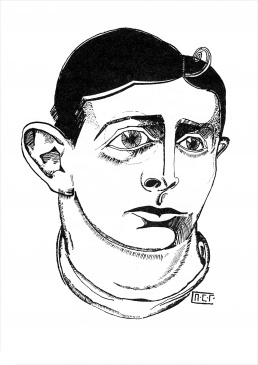 Dziga Vertov and Early Animation: Sarah Lewis Interviews Professor John MacKay, 2010. Man with a Movie Camera: The Global Remake, . This page was last modified on 2 December 2018, at 11:38. This page has been accessed 91,083 times.